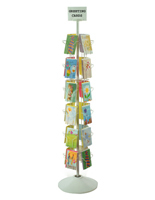 This greeting card fixture has 72 to 5"w x 7"h pockets for stationary. This supplies holder for commercial use has 72 pockets displayed on four sides, or "wings," with 18 pockets each. 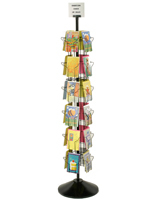 This floor standing greeting card fixture, inventory holder is one of our most popular wire products. This alternative to wire shelving, showcases your holiday and birthday selections (plus all manner of cards that you sell.) 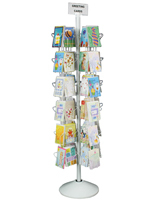 This greeting card rack, such as a commercial display comes with a sign clip that can be secured to the top for advertising a specific genre of greeting supplies. 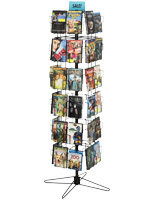 This wire shelving unit, also known as a store kiosk, that has a plastic or thick cardboard sign option (retailer must provide their own sign) tells customers what they are about to peruse. 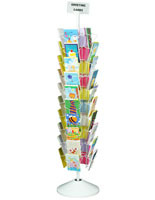 This stationary display, greeting card fixture has a durable plastic base that won't tip. This message holder, not unlike a wine rack for commercial supplies, has a durable steel wire composition power coated in black gloss. These greeting card fixture is shipped disassembled, but is so easy to assemble wire products like this that no tools are required. 5.5" x 4.8" x 1.5"